Home » Blog » Can you get rid of love handles on an exercise bike? Investing in an exercise bike is s sure-fire way to accomplish your weight-loss goals this year; it’s hard to beat the convenience and ever-present reminder when you see the keys to your plan every single day. Although you certainly have a general understanding of how an elliptical, exercise bike or treadmill can benefit you, let’s go through some specific methods for dropping the extra pounds. Especially those persistent Love handles with an exercise bike! If you’ve ever worked out with a trainer at the gym, or read any of the popular fitness magazines, then you’re aware that it isn’t really possible to spot reduce particular sections of fat on the human body; at least, not with aerobic training. Do regular workouts that get your heart rate up; this is the level at which fat-burning occurs and cardiovascular health improves. With this method, you will lose weight overall first; only then can you expect to changes in those specific parts of your body that you want to improve. An exercise bike can’t directly target your love handles; but it can help you with overall weight loss, which indirectly affects that area. Graduate to high intensity interval training – which consists of short, explosive periods followed by reduced biking in the rest phase. Repeat this for about half-an-hour. This is a real fat-burner; it drives your metabolism into a heightened state that really uses up the calories and burns fat. If you have love handles, this generally means you are walking around at a less than optimal weight, and your body is storing the excess fat in your mid-section. As your weight melts off and you get down to a certain size, you’ll notice that your love handles naturally melt away. 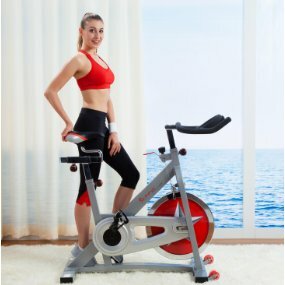 An exercise bike is largely a workout for your lower body; if your workouts are vigorous enough, you’ll benefit from both the cardio and the muscle tone. At first glance, it might not be obvious how this helps with your love handles, but think about it like this: since working your legs requires the greatest amount of effort, this leads to more calories being burned, which reduces your overall fat level. Your body will eventually get to the level at which it doesn’t preferentially store excess fat in your mid-section, and it will do so faster than just about any upper body aerobic workout. Even better, if you find a way to combine your aerobic exercise bike workouts with light-to-medium sized dumbbell workouts and body squats, you’ll see significant progress even faster. Your body weight is enough to make body squats taxing – especially if you minimize your rest periods in-between sets. These keep your heart rate elevated and in the fat-burning stage, even as you manipulate weights and build muscle tone. All-in-all, a good exercise bike will put you on the road to losing your love handles, by stimulating overall weight loss. Start out at a level with which you’re comfortable, and gradually move up to high intensity interval training for the best results you can get at home. Put more pressure on your body by engaging in body squats, and you’ll see vast improvements in your midsection and love handles. We have three great choices for exercise bikes to help you shed those pounds and eliminate the love handles forever.